Find and compare the best prices from a range of well known car rental companies at Trabzon Airport. This is a free to use facility, enabeling you to book direct with the company quoting the price. This small airport is in-fact the largest airport in the eastern part of the Turkey Black Sea coastline. The airport has two terminal buildings, Domestic and International, the former having opened in 2008, and the latter in 1998. A bus service leaves the airport 25 minutes after planes land. 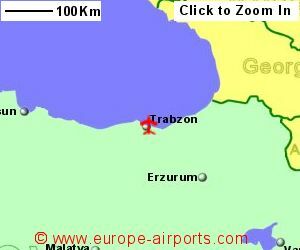 3.3 million passengers passed through Trabzon airport in 2015, an increase of 19% compared to the previous year.Sorry but we do not have any details of flights from the UK or Ireland to Trabzon Airport.